Help Howard Come Home for Christmas! 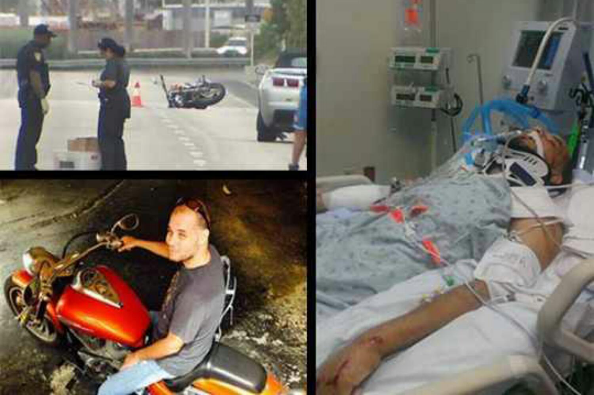 On Oct. 14, Howard Carney was riding his motorcycle when he was struck from behind by a driver that admitted to looking down at his phone, just prior to the impact that put Howard into a coma, with brain, lung, arm and knee injuries. The incident happened in Miami, Florida. Howard is a Kansas City native and his family wants to bring him home. He's been cleared for specialized transport. Unfortunately the costs are high and the insurance is inadequate. Help him here. Howard is a deserving guy. He is a Marine veteran. He is a former KC Police Dept. Detective. He is a father of five. He is well-known in the Salsa dancing community here as "The Salsa King," for his organized and impromptu salsa dance lessons. This is an opportunity to highlight how dangerous smart-phone use is while driving. We hope to help keep his story in the news during his recovery. This is an opportunity to highlight how vulnerable bikers are to significant injuries; not to scare people from riding, but to implore people to make some effort to "Learn to See Cycles." Maybe you saw this story on Fox4 this weekend. Or maybe you saw it earlier on KCTV5. Get to know Howard and send him messages for his sister to read to him! His family needs him home. And his sister (who just lost her job today) needs to come home to KC. More importantly, Howard needs to come home. According to his sister, those with brain injuries recover best when they have familiar surroundings. What can you do to help Howard? Donate. Spread the word. Share this link. Send a message to Howard or his sister Angie Urban, [email protected] (she also accepts donations via Paypal at that email address). Pray. Pray. Pray.. for his recovery and for his family.